Hosts: Evan "Vampt Vo" Minto, Alain a.k.a. "Hisui," Kate a.k.a. "Narutaki"
We've got a really short one this time, as the Ani-Gamers Podcast is invaded by Hisui and Narutaki (real names Alain and Kate) from the Reverse Thieves anime blog. 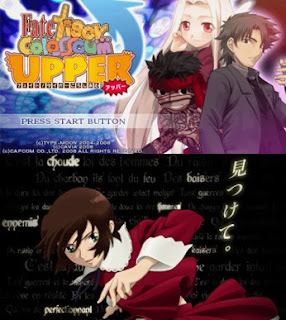 These two are here to talk about some overlooked gems from 2008 - including the Capcom game (featuring Type Moon characters) Fate Tiger Colosseum Upper and the BONES anime The Daughter of Twenty Faces. Oh, and see that litle "part 2" in the title? That means that you should listen to podcast #011a, since this episode is sort of a continuation of that one. Sort of. And before anybody asks: yes, Alain and Kate are talking about things that were not released in America, even though our Best of 2008 write-ups had that as a requirement. It's fine - it's not like we're giving out any official awards here. [0:01:44] Introductions, introductions. Hisui (Alain) and Kate (Narutaki) introduce themselves, but never really manage to mention their online aliases. That's why we have show notes. They explain how their blog is NOT about burning things in fire. This is a shameful thing for any blog. [0:04:20] In this segment, Alain is simultaneously explaining why Fate Tiger Colosseum Upper is awesome and trying in to pronounce its name. This game is based on the Type Moon franchises (i.e. H-GAMES), but it has cute little characters and silly storylines. Topics for this segment include Magical Sister Priestess Karin and vicious chibi violence. [0:10:25] Now it's Kate's turn, and she's talking about The Daughter of Twenty Faces, which could also be called Chiko, Heiress of the Phantom Thief if you were the Anime News Network. It's a mystery anime by BONES that centers around some girl and a thief who probably doesn't have twenty faces, but people call him that anyway. Topics for this segment include every mystery cliche ever, Matsuda, and "The Detective Girls." [0:17:44] Outro: Black Jack? Yes, Black Jack.